That Tree of Life at the Faena Forum? It may have a short life span. Leonard Blavatnik, Alan Faena’s business partner, wants to keep the Tree of Life sculpture that was installed in front of the Faena Forum for Art Basel 2016. The 20-foot high sculpture facing Collins Avenue was created by Studio Job, an internationally recognized design house. 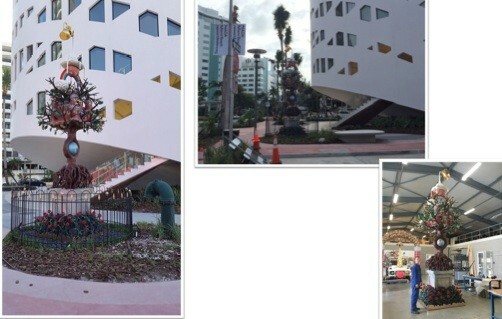 3420 Collins Avenue, LLC which owns the Faena Forum and is 100% owned by Blavatnik, is seeking an after-the-fact Certificate of Appropriateness for the sculpture and a variance to reduce the minimum required front setback. The sculpture currently sits on a concrete foundation with a 6’3” setback from the property line along Collins Avenue where the required setback is 20’. The application claims a hardship in moving the sculpture stating the Forum’s subterranean parking garage and its roof construction prohibit placing the cement slab 20’ back from the property line and that the unique shape of the property makes relocation within the site impossible. In its report to HPB members for consideration, City Planning Department staff has no objection to the sculpture and believes it “will not detract from the surrounding historic district”, however they recommend it be relocated to comply with minimum yard setback requirements. They say the height exceeds the maximum allowed for structures in required yards and they disagree with the claim of hardship for allowing the artwork to stay. “The size, height, location and construction of the sculpture was the applicant's choice,” the staff report says. Planned for the 900 block of Washington Avenue, this project has been approved by the Planning Board and is seeking HPB approval for “substantial demolition, renovation, and restoration of existing structures, and construction of a new 7-story ground level addition for a hotel.” The HPB largely approved the project with requested changes in December. Property includes 915, 947, 955 Washington Ave, all “contributing structures” built between 1936 and 1942. The owners of the historic Clay Hotel, originally constructed in 1925 and within the Espanola Way Historic District, want to renovate and remodel the building “to recreate the feel of a true Spanish village”. In the process, they plan to return to the original name, The Espanola Hotel. Plans call for renovations to the lobby, creating courtyards for guests, refinishing and painting the buildings and the use of awnings and ironwork. On the interior, renovations include covering existing open corridors with “landscaped trellis materials” to deflect some of the heat. There would also be a rooftop deck with bar, lounge seating, and spa pool for guests. Related: 1436 Drexel Ave, the Matanzas Hotel renovation which is part of the Clay Hotel and just West of the main building. The Setai at 2001 Collins Ave is seeking to reintroduce retail entrances along Collins Ave.